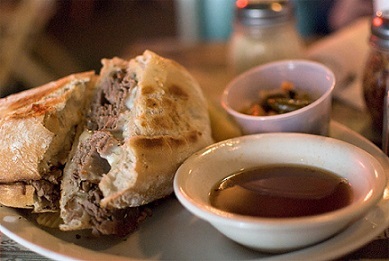 "With au jus = with with the juice"
Au jus is French for "with its own juice." In America it describes a thin sauce for using with beef. It is not thick like many sauces or gravies. This sauce is sometimes served with (on) the food or placed in a small individual bowl on the side for dipping into. 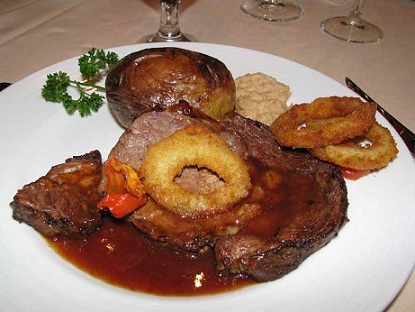 It is sometimes served in a gravy boat, as well. You can use this sauce for any beef item, including prime rib, roasted New York, tenderloin and it is excellent with French Dip sandwiches. It's great! 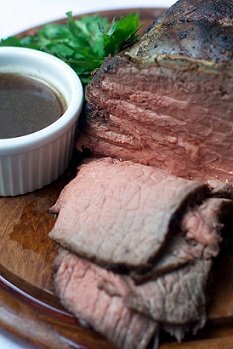 The drippings from a roast are ideal for making this recipe because there is usually just enough fat in the drippings to add a good amount of flavor. 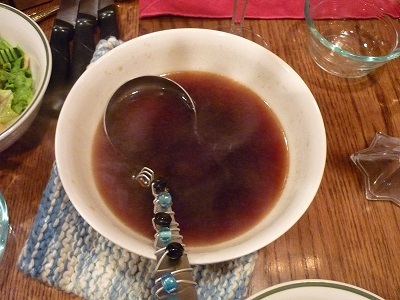 I suggest you do not use artifically flavored, salty bouillon cubes to make your sauce. There are some very good organic bouillon products available in more and more grocery stores. Use those for additional flavor if needed. Serve warm in small individual bowls or in a gravy boat. This delicious beef sauce is as popular an enhancement to certain beef items as is Horseradish Sauce. Enjoy your beef sauce and the company of those you share it with! Did you know? Making this juice (sauce) is more a technique and less a recipe. Don't be afraid to experiment.